A1 on 9/11 … and some memories – Pamela Wood. I’ve been on vacation for the past week, so I wasn’t assigned any stories related to the 10th anniversary of the Sept. 11, 2001 terrorist attacks. I admit I didn’t mind at all … it’s tough with these types of stories to say anything new, different or profound. It’s a real challenge for journalists of all stripes: writers, photographers, columnists, designers. Since I was out of the loop, I didn’ t know what my newspaper’s front page would look like. I really liked what the paper did. Almost all of A1 today is a huge night photo of the blue beams rising from the World Trade Center site, with the Statue of Liberty visible in the foreground. It’s a striking image. The Sunday Capital on 9/11/2011: I like it. The headline is “Remembering 9/11” and there are just a few paragraphs of text over the image. At the bottom of the page are blurbs highlighting all of the 9/11 stories inside the paper. In a way, I think the front page acknowledges that it’s difficult to sum up in words what we feel and think today, 10 years after the attacks. It is a testament to the power of a photo to capture emotions with no words. 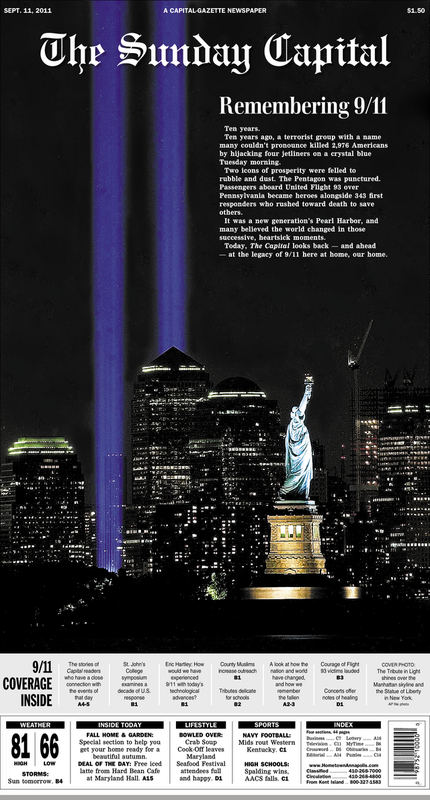 Many chose a similar route as my newspaper, with A1 devoted entirely to 9/11 with huge photo and very little text. Some chose the same photo my paper did. Other newspapers covered A1 with all 9/11-related stories and photos, but with a more traditional look — a big centerpiece with striking art and smaller stories and headlines around it. Still others used 9/11 as a centerpiece, but mixed in non-9/11 news stories around it. I imagine there were challenging discussions in newsrooms around the country about how to play the 10th anniversary of 9/11 and how much real estate on 9/11 should be devoted to it. On a related note, I thought I’d jot down my 9/11 story because, well, everyone else is. I was a reporter at the Maryland Gazette, a little more than a year out of college. The Gaz publishes on Wednesday and Saturday mornings, so Tuesday was a deadline day for us. It was a beautiful morning and as we went about things, somehow — I don’t remember how — we heard about the first plane striking the World Trade Center tower. I remember our small staff crowded into the office of our editor, Bob Mosier, to listen to the radio to hear what was going on. Eventually, I, along with everyone else, realized this was a big deal. At some point — probably after the second plane hit, or after airplanes were grounded? — Bob ordered us all out to cover the story. I was sent to BWI Airport. Photographer Paul W. Gillespie — who was either off or on a late shift that day — was called in. He picked me up outside of the Gaz building and we sped over to the airport. It was the first of many times in my career where I was heading toward a place that most people were trying to leave. Back to 2001, I remember a little bit walking around inside the airport. I don’t remember interviewing people at all, although I must have. And I don’t remember what I did all afternoon, although I must have been interviewing and writing all day. It’s kind of a blur. Previous postOne of those days … part 2! Thanks, Pam. It was a crazy day, wasn’t it? I remember hearing a brief on WTOP about the first plane as I was driving into work and thought the pilot had a medical emergency or there was a malfunction in the plane. It didn’t seem real that, although people in other parts of the world wanted to hurt us, that they’d actually act on it. It still doesn’t, in a weird way. But when we heard about the second plane, and Bob snapped us out of it and ordered the front page to be ripped up, I knew it’d be a crazy day. I guess it’s reporter instinct, but I so wanted to be out there with all of you actually doing something, not working the phones to add to your stories. Ahh, thank you for filling in some of the blanks. I didn’t remember that you were in the newsroom. Working the phones and blending that in with calls from reporters and turning it into copy that makes sense is a valuable skill! This makes me think I should look up our stories in the archives and see how they hold up 10 years later.